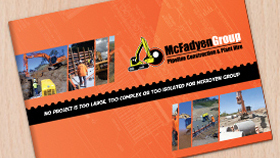 McFadyen Group - McFadyen Group is a leading Australian civil works contracting company specialising in pipeline construction, concrete structures and plant hire. Displayed copies of these Policy documents are available for review at MFG’s Yatala office. The IMS is intended to achieve Client satisfaction by preventing and correcting nonconformity in all areas of operations. The IMS will ensure the identification, assessment and control of QA, safety and environmental risks within MFG and across its various projects. MFG is also a member of Zero Harm at Work Leadership Program. MFG makes a significant contribution to influencing strong work health and safety practices. The Zero Harm at Work Leadership Program aims to build a positive culture of safety in workplaces and its objective is no harm to anyone, anytime while at work.